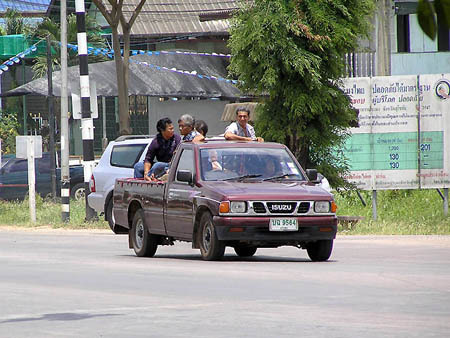 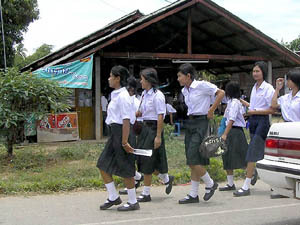 Photo Gallery of Kamphaeng Phet in Thailand. 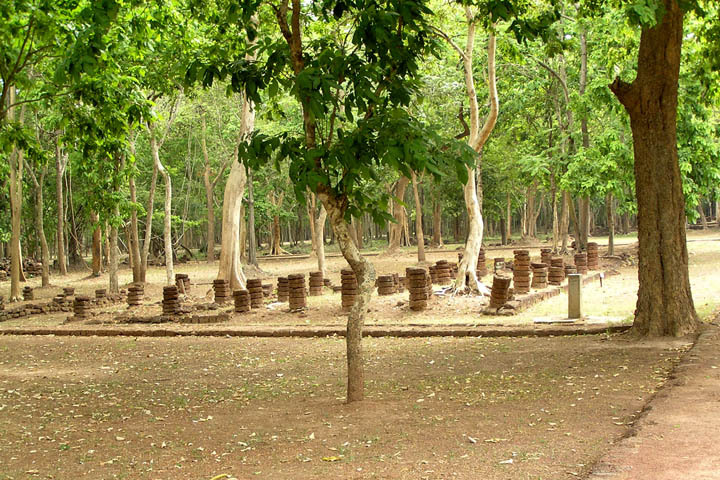 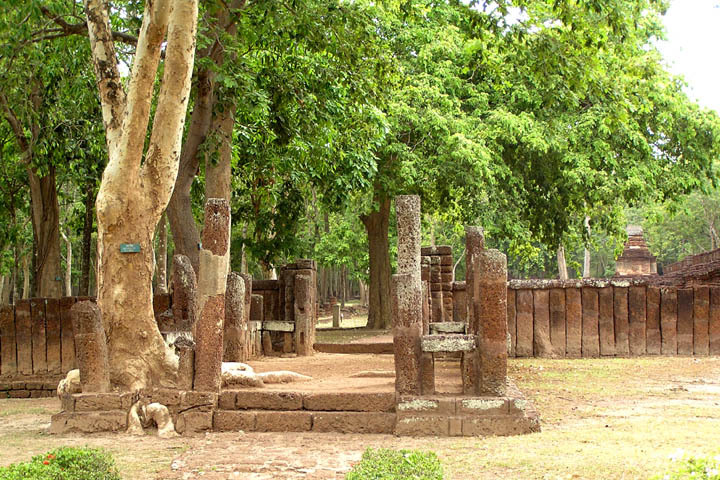 Scenery in the Kamphaeng Phet Historical park. Ruins are in a lot of green like this. 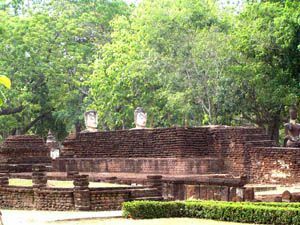 Kamphaeng Phet was a major fortress city to counter the threat from the invasion of Burma from Sukhothai era to Ayuttaya era. 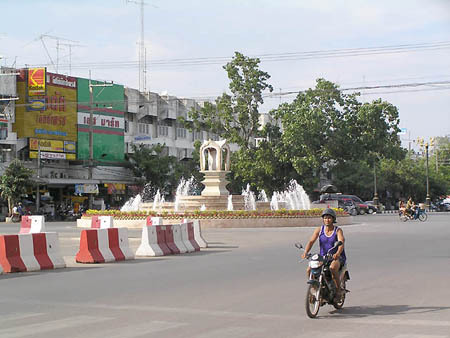 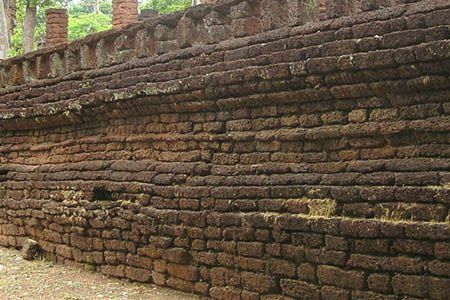 In fact, the name, "Kamphaeng Phet", means walls of diamonds. 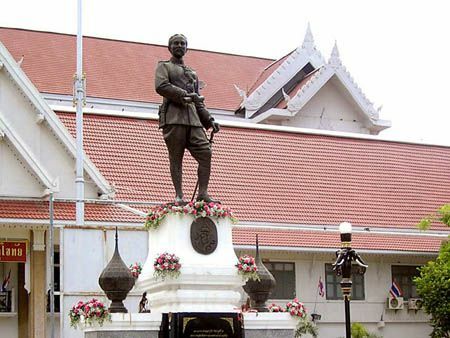 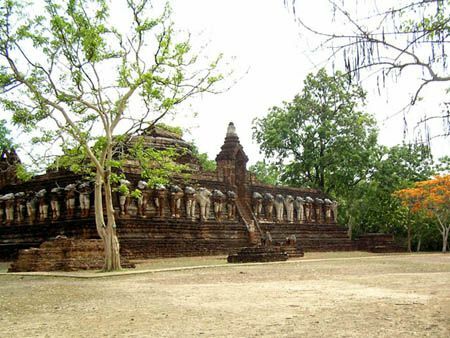 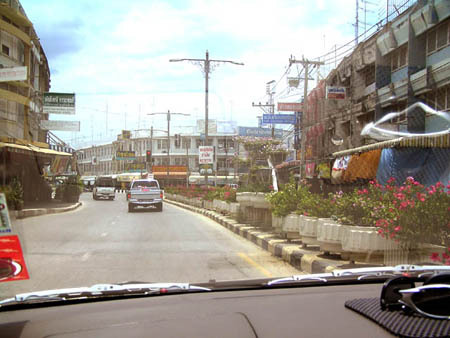 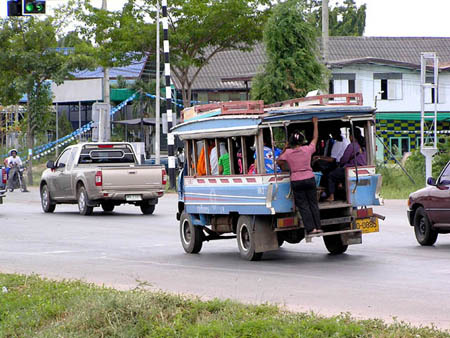 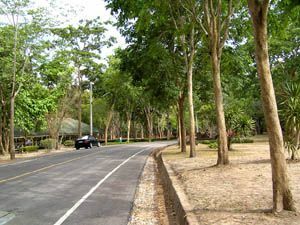 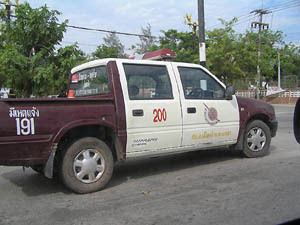 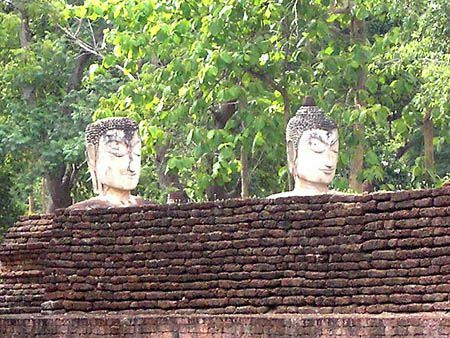 Kamphaeng Phet is located 430 km north of Bangkok, about 5 hours by bus from Bangkok, about 1 hour by bus from Sukhothai. 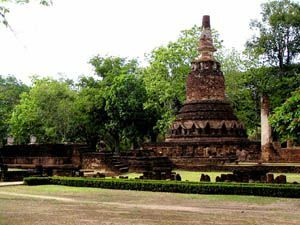 There is " Kamphaeng Phet Historical Park " both in and outside of the city, and they have two big festivals; Celebration of Sukhothai dynasty in February and the harvest festival in October. Kamphaeng Phet is famous as the area of production of called Gluay Kai (Egg banana). 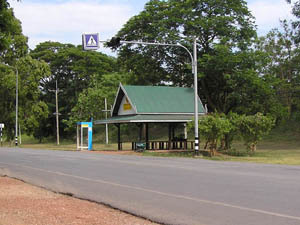 This shows the scenery after going out of the town. 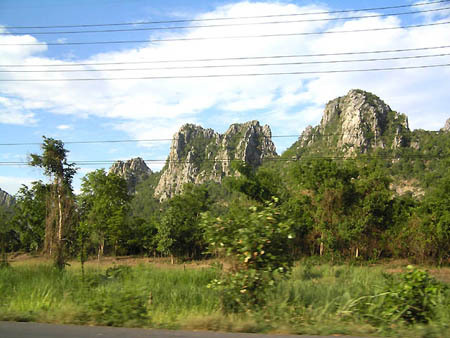 It looks rock hills and wonderful. 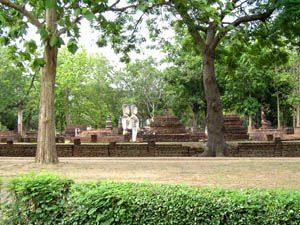 I dropped by Kamphaeng Phet on the way back to Bangkok from Sukhothai. 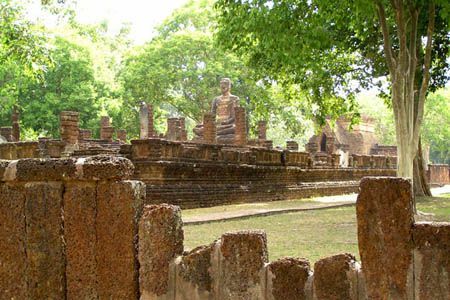 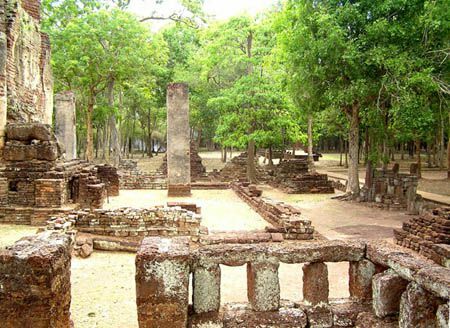 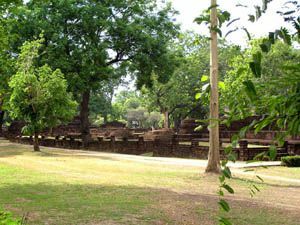 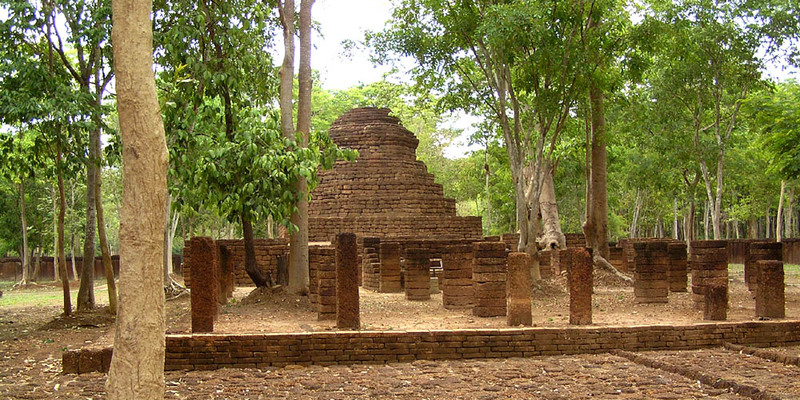 Kamphaeng Phet also has a historical park (Kamphaeng Phet Historical Park) and if you are interested in history, it's great to visit here as well as Sukhothai. 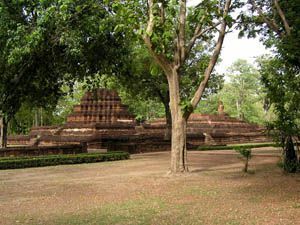 I felt that not so lots of tourists were here and Kamphaeng Phet was not so major a place to visit compared with Sukhothai. 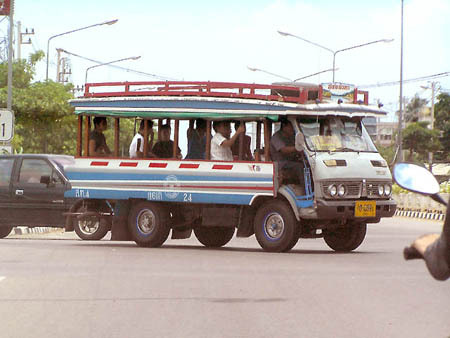 "Song" is "2", "Taew" is "line". 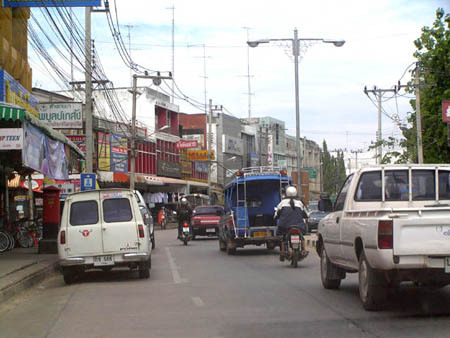 (This is "Song Taew", too. 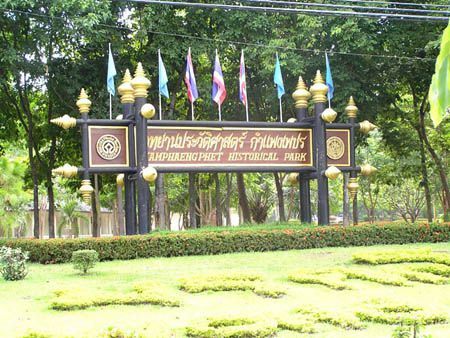 Kamphaeng Phet Historical Park ! 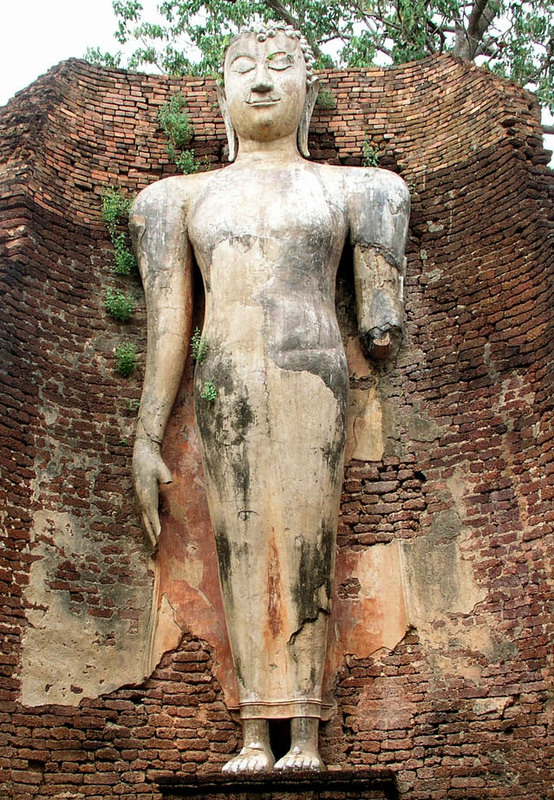 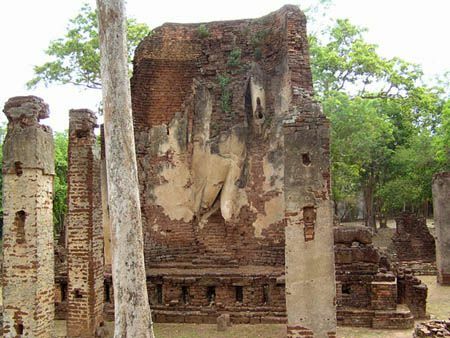 Compared with Sukhothai historical park, ruins are out of shape. 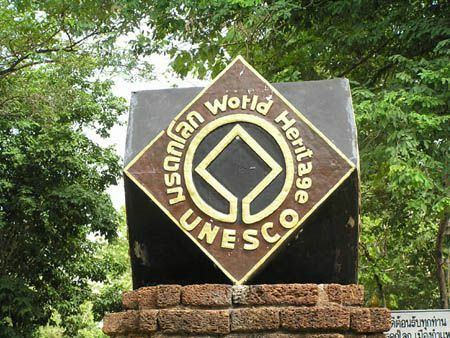 This park has been registered as a world heritage site by UNESCO since December 12, 1991. 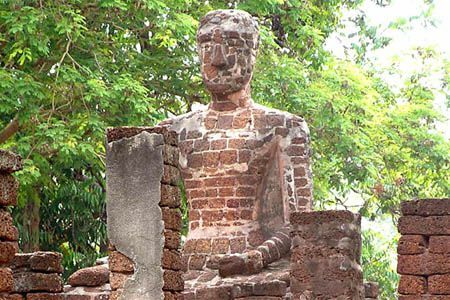 It's said that a chedi and two white Buddha statues still remains and the Buddha statues are in Uthong style in Ayuttaya era. 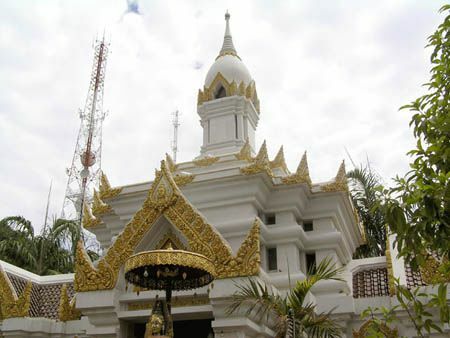 The temple, Wat Phra Si Ariyabot, was built in fifteen or sixteen century, which stands on a wide base called Paitee. There is no photo but it has a gate and lion statues at the front of the temple, big sitting Buddha statue inside and a hall with columns (Mandapa) at the backside. Inside the hall, there are Buddha statues that show four postures; sitting, walking, standing and lying ones. 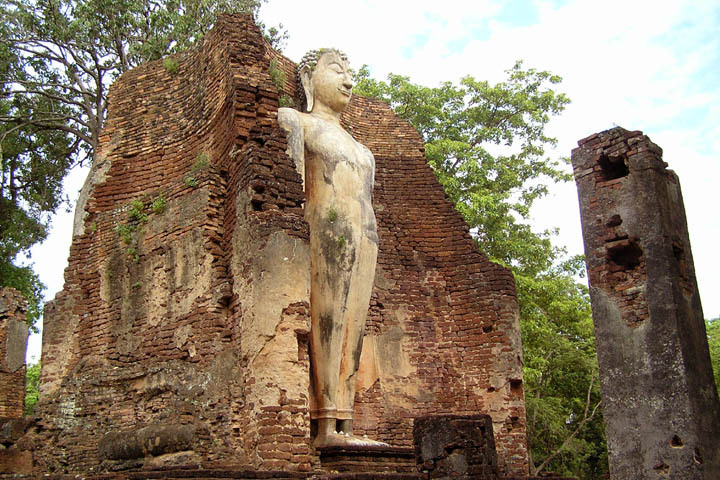 (A little broken but you'll see a big standing Buddha.) 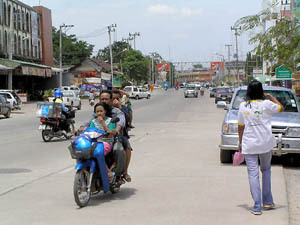 Backside ? 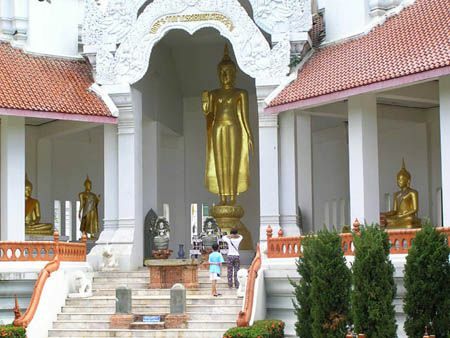 This temple was built in 15th or 16th century and located at the top of the hill. 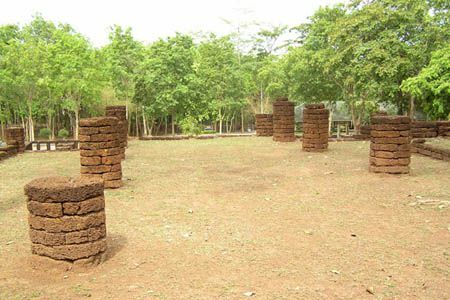 (The square base is 31m on a side. 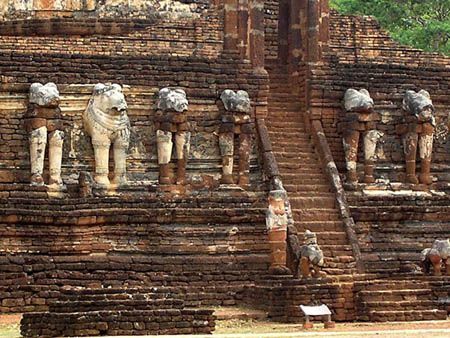 The images are lions and guardian deities made from lime. 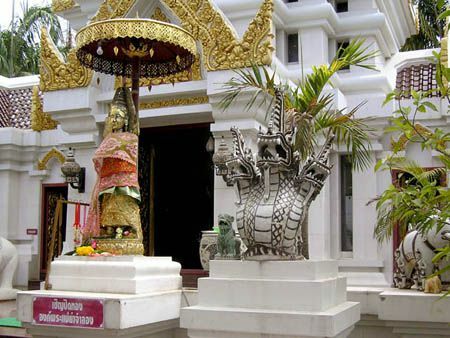 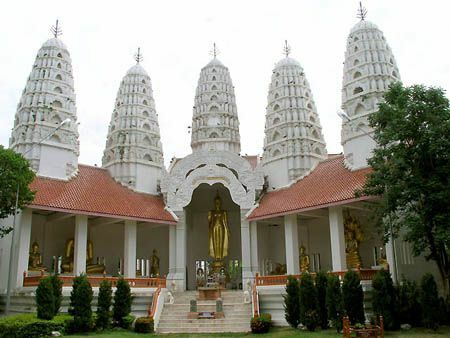 Each city has a main temple of the city, and the main temple of Kamphaeng Phet is " Sarn Pra Mae Yaa". 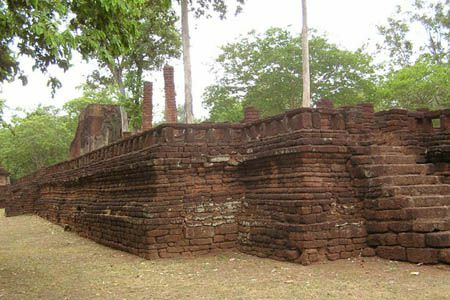 From the explanation of this temple, this temple was 7 km away from Kamphaeng Phet, and every time people conducted a ceremony to pray for rain, something mysterious happened. 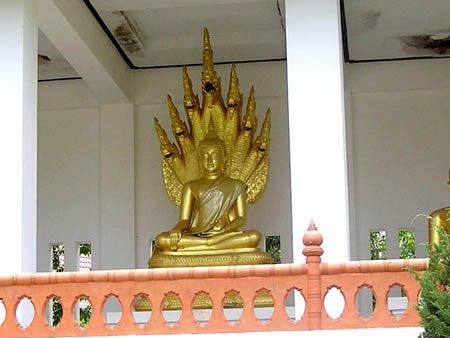 They made a replica of the Buddha statue in the ceremony not to hurt or lose in 1953 (2496 B.D) and have enshrined it here. 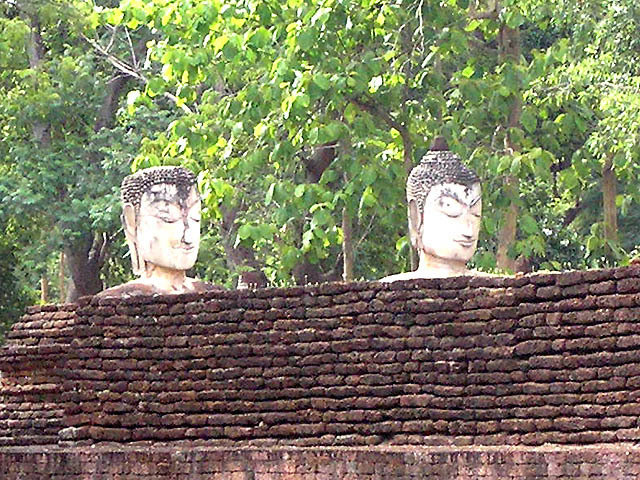 (Close-up of the picture left. (Another building in the temple grounds. 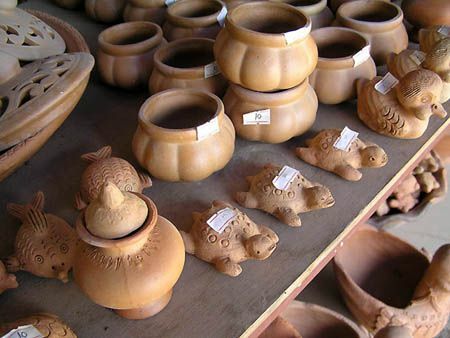 We dropped by a pottery shop along the street on the way back to Bangkok. 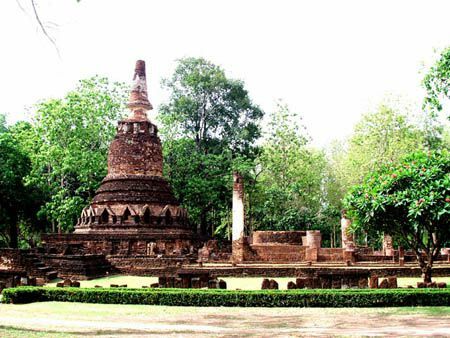 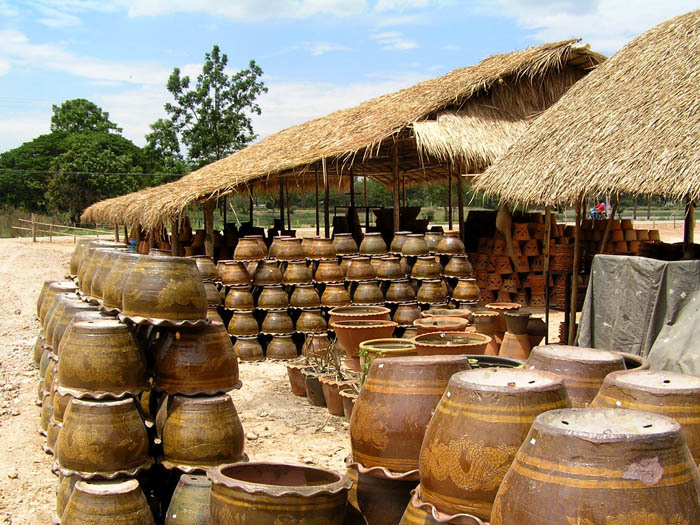 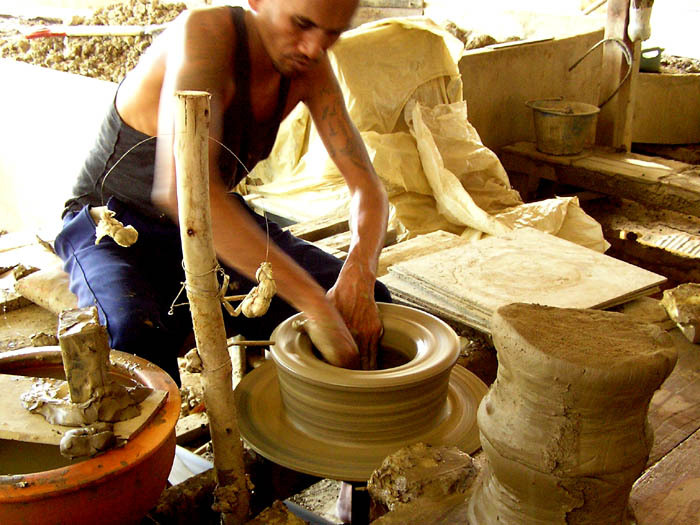 This area is famous for pottery as well as Sukhothai. 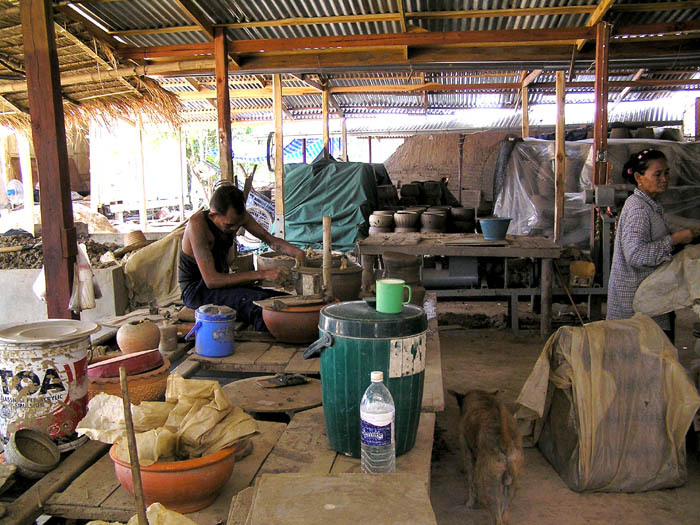 We dropped by a pottery shop along the street on the way back to Bangkok. 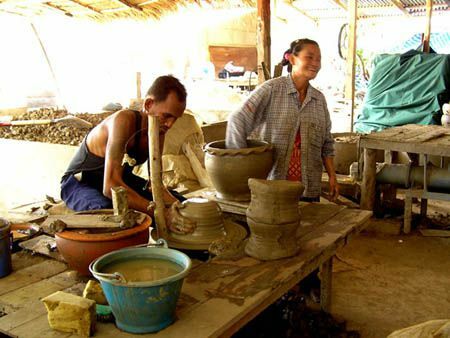 This area is famous for pottery as well as Sukhothai. 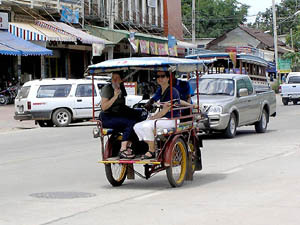 Now, let's take a look. 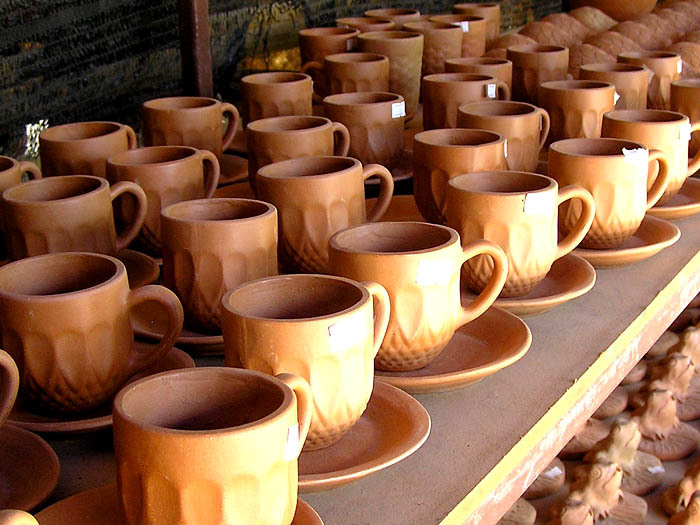 20 to 30 Baht per one cup. 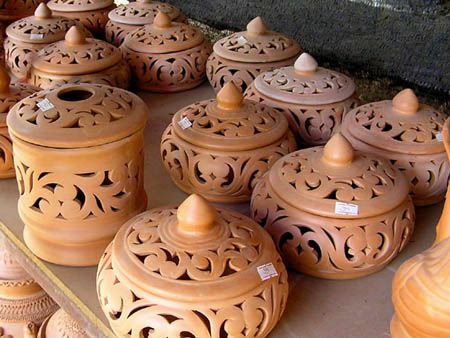 35 or 55 Baht per one pot. (They are pottery of tortoise, duck and funny eyed fish. 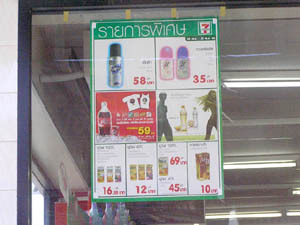 About 10 Baht per each. 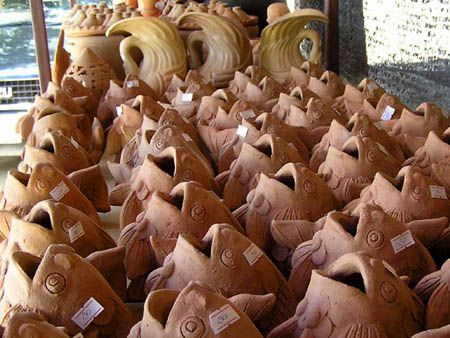 (Pottery of fish. 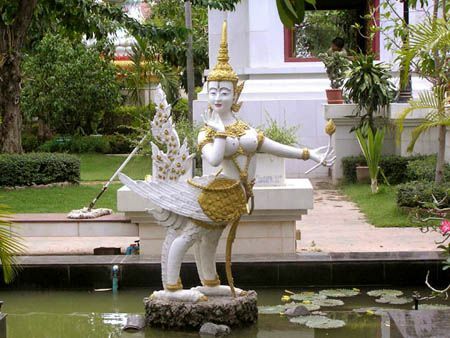 Are they for waterworks ? 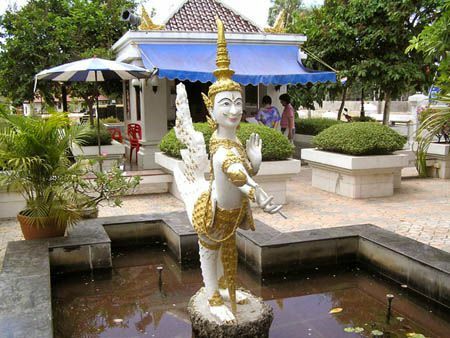 Are they for waterworks ? (A craftsman works in the shop. (A craftswoman is working also. 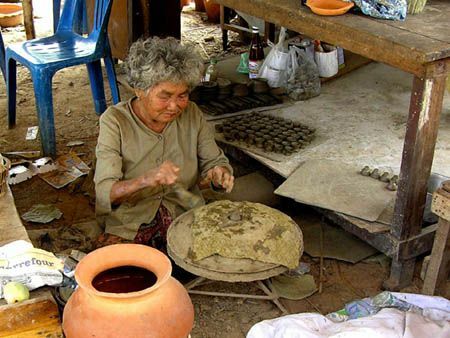 She is making small potteries.